Recorded in Hasparren, in the French basque county, we find two of the country's most eloquent free improvisers in a fantastic duo album. 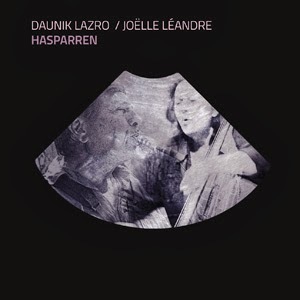 Daunik Lazro is on baritone sax and Joëlle Léandre on bass. The opening track starts with bowed bass, quietly and with pulse. Lazro joins and makes his notes shimmer lightly above the restrained beauty of Léandre's playing, sustaining his high notes at times, going to the lower registers when Léandre takes a more prominent role. They don't dialogue, they don't battle, they just move together, carefully, cautiously, revelling in the sonic universe they create, an improvisation which should never stop if you ask me. On the fifth track, Léandre plays solo, demonstrating her unique skill of free improvisation while maintaining an uncanny focus and sensitivity, demonstrating what one single bass can sound like, at moments beyond belief when pizzi and arco interchange rapidly, when various sounds escape from the instrument almost as a full band. It's only six minutes, yet it's phenomenal. Beautiful, beautiful ... and rich. Listened to some samples online last night which had me going to the NoBusiness website and order the cd. Really looking forward to hearing the whole album.